A dazzling tour of the universe as Einstein saw it. How did Albert Einstein come up with the theories that changed the way we look at the world? By thinking in pictures. Michio Kaku, leading theoretical physicist (a cofounder of string theory) and best-selling science storyteller, shows how Einstein used seemingly simple images to lead a revolution in science. Daydreaming about racing a beam of light led to the special theory of relativity and the equation E = mc^2. Thinking about a man falling led to the general theory of relativity giving us black holes and the Big Bang. Einstein's failure to come up with a theory that would unify relativity and quantum mechanics stemmed from his lacking an apt image. Even in failure, however, Einstein's late insights have led to new avenues of research as well as to the revitalization of the quest for a "Theory of Everything". With originality and expertise, Kaku uncovers the surprising beauty that lies at the heart of Einstein's cosmos. 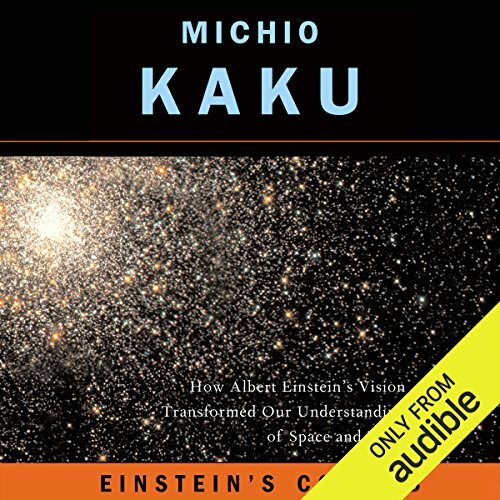 ©2004 Michio Kaku (P)2013 Audible, Inc. If you're a fan of Einstein or want to know why he's such a legendary figure, this book will inform you of all of his achievements and the importance he had on Science and humanity. history ,science with a human dimension. detailed history of this period in science and political events and the personalities that shaped history. just right ,good pace and creates the mood of the era thru his reading very good. great author ,great topic,well read very informative loved it recommend audible and this is a favorite topic. I'm still not sure I understand all the science, but it was a good mixture of the science and the struggles faced as each scientist tried to build a support for his research. Einstein was truly a marvel - 50 years ahead of what we could test in the lab. Brilliant beyond belief. I took theory of relativity and quantum theory in college - love the fact he had pictures he referenced. I like the insights into the various personalities, competing theories and politics that played into it. thanks for a good suggestion and helping to keep my commute something much more than a boring ride. If your a genius theoretical physicist you might understand most of this book. If you could not understand half of it like me you might still wish to listen and enjoy it. The science and math explanations were completely over my head. However listening to them was important. It made me realize how brilliant this man was in a time when computers were not in existent. This is a biography of one of the greatest individuals in history. Not just a mega genius but an approachable funny likeable man whose theories have changed and are still changing the world. Listen to this book! I admit that I never seriously studied Einstein's equations or quantum physics, but this book gave me a great outline of the development of modern physics. I am now motivated to listen to other audiobooks on modern physics or even get some paper books that contain equations. Michio Kaku is also good at depicting human side of Einstein and other physicists. It's fun to think about Einstein writing numerous love letters. I also never imagined that Schrödinger was a serious womanizer! Great insight to a great mind. Can't say I followed all the science, but this book does give some foresight into Einsteins thought process. I really knew nothing of his early life, and enjoyed listening about it. The narrator does a very solid job, and the book is well written. I got a little confused with some of the heavier concepts, but still overall the author gives me at least a glimpse into it. I really liked this. I enjoyed Walter Isaacson's Einstein, but this was more reader(listener) friendly. They both touched on many of interesting tidbits that are commonly unknown about the great natural philosopher/physicist, but this one seemed to shed light on those in a more compassionate way. This is not as comprehensive as Isaacson's biography, but it is much more warming, and leaves you with an interpretation of what many authors call his non-productive years, that is nearly 360 degrees different. The Narrator was fine, and the life of Dr. Einstein was told in such a way that even if you have read many other biographies on him, this will be different enough to warrant the purchase. Enjoy! Einstein's Cosmos: How Albert Einstein's Vision Transformed Our Understanding of Space and Time by Michio Kaku is third biography of the physicist that I have recently read/listened to. It focuses more on his work than his personal life. The author explains his complex theories in words and with examples that make them easily understood. This would be an excellent read/listen for anyone who has always wanted someone to explain general relativity and string theory in a way they could be understood. I will probably reread this book again next year. It is that good. I have been fascinated with the concepts of "relativity" since first introduced to them in the 1950s. This book and another book, "The universe and Dr. Einstein" helped provide sone insight for the non-scientist. I am planning to read another book by this author. I would only recommend this to a friend well grounded in physics. I would have explained the significance of Einstein's accomplishments in simpler terms. What three words best describe Ray Porter’s performance? It was good but uninspired. i had no trouble following his narration but it did not draw me in. Do you think Einstein's Cosmos needs a follow-up book? Why or why not? No, what's here is already too technical in my opinion. I enjoyed learning about Einstein's human side but I think there are better books for this. What made the experience of listening to Einstein's Cosmos the most enjoyable? Ray Porter is my favorite Audible narrator. This is a good balance of Einstein's biography and conceptual explanations of some of the big ideas in Physics from Newton up to and including the present. I liked that Kaku attempted to demonstrated the value of Einstein's often overlooked and failed attempts at a unified theory.